Students feeling safe and represented on campus comes second to upholding free speech at the UC. The UC Center for Free Speech and Civic Engagement held its inaugural #SpeechMatters conference on March 21 in Washington D.C., which I and about 30 other UC students attended. Where I hoped to find productive and innovative discussion, I was met by UC administrators and special guests bent on pushing an agenda that disregards student concerns. Hate speech itself sparked the UC’s establishment of a free speech center. Far-right provocateur Milo Yiannopoulos came to UC Berkeley in February 2017 and the UC established the center later that year. His presence prompted peaceful protests and disruptive riots. Students rejected Yiannopoulos for his racist, anti-immigrant rhetoric and hateful ideals that would endanger students if allowed to go beyond speech and turn into action or law. To establish a center that defends all speech in response to students’ pleas to discourage hate speech misses the point entirely. Free speech is about promoting productive conversations, not holding space for bigotry. “We must challenge hateful speech with more speech,” said UC President Janet Napolitano in her opening remarks. The UC did not achieve this at the conference. No speaker, including Napolitano, discussed the effects of hate speech on traditionally marginalized students at length. The conference celebrated free speech rather than focusing on ways the UC can balance upholding free speech with providing an inclusive learning environment. It didn’t make any other conclusions about the future of free speech on campuses either. As a student in the room I felt like an auxiliary, tokenized presence without a chance to speak my opinions. Throughout the afternoon, columnists, professors, university officials and legal directors discussed their opinions on free speech. Students were given a separate space to discuss free speech on campuses in the morning — underwhelming considering I discuss these topics with students near daily at UC Santa Cruz. Perhaps to the out-of-touch administrators present, facilitating a student discussion was exciting, but for me it fell flat. By attending, I hoped I would find a space to discuss my views on free speech with the special guests the conference boasted. But somehow, a conference discussing free speech on campuses failed to include students in that discussion. During the conference itself, my only chance to express my opinion was in the form of questions to the panelists. Only three to five people were chosen to ask questions to each panel. 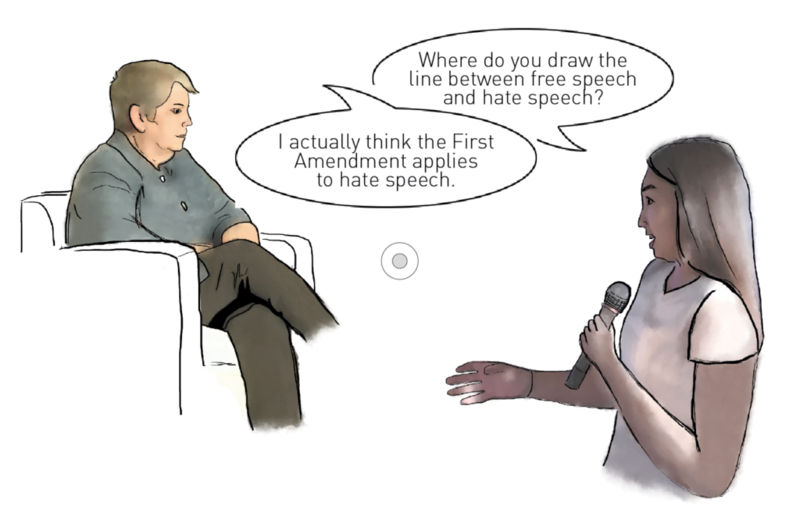 A student from UC San Diego named Kimberly prefaced a question by saying, because there’s no way to measure lasting psychological effects of hate speech as it happens, hate speech isn’t defined or condemned. She asked the last panel of speakers, including Napolitano, where the line between free speech and hate speech should be drawn. If hate speech is protected as free speech, UC administrators must demonstrate disapproval of hate speech in other ways. Instead of pouring resources into a celebration of free speech in all its forms, the UC needs to focus on how it can support students when they feel targeted by hate speech. It must start that conversation not in a room filled with policymakers and professionals, but by meeting with students in spaces where we have the mic and administrators are there to listen.